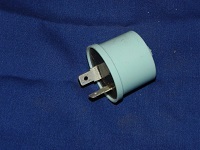 This 12 volt turn signal flasher 224 is new, NOS, plastic can with no lettering on the can sides as normally found. These plastic flashers have the lettering molded into the top. 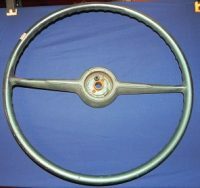 A Signal-stat brand flasher, short, short round in shape and in mint condition. This plastic flasher is Blue in color. It is a 2 terminal flasher with the terminals in the normal right angle configuration.